by R. Pepper Crutcher, Jr. 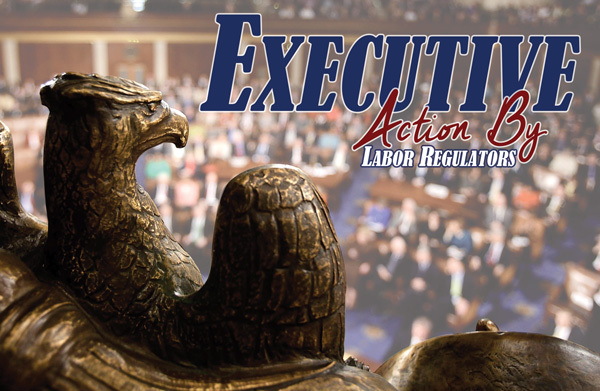 The U.S. Department of Labor (DOL) and the National Labor Relations Board (NLRB) are engaged in their own “executive actions” to implement union- and employee-friendly policies at the expense of employers. Here’s what you need to know about NLRB elections, NLRB “joint employer” rules, and coming changes to DOL’s overtime exemption rules. Regional offices of the National Labor Relations Board (NLRB) have conducted secret ballot elections in Mississippi, in response to union representation petitions, for over sixty years. Early in this administration, a union-friendly Congress tried its best to dispense with those elections through a bill called the “Employee Free Choice Act.” Had it passed, the NLRB could have compelled employers to bargain with unions based on covert card-signing campaigns, so that, despite the bill’s name, the employees would never hear the employer’s side of the argument. It was a close run thing, but EFCA failed. Beginning in April 2015, the NLRB, a five-member commission (three Democrats, two Republicans), decided to cut in half, roughly, the time between the union petition and the employee vote. A union might spend a year or more secretly organizing a workforce, then file a petition knowing that the targeted employer will have only days to identify and counter its messaging. In New Orleans, Region 15, for example, records of recent filings published online suggest that elections have normally been held within three weeks after a petition is filed. Now would be a good time for nonunion employers to communicate to workers about union representation. Later may be too late. Regulating employment conditions is a key to political control of a market economy. 362 NLRB No. 186 (August 27, 2015). Under prior law, mostly undisturbed for many decades, two or more employers that co-determine wages, hours, and working conditions had labor law obligations to the jointly controlled employees, and their union, regardless of whose payroll they were on. Franchisors, site owners, manufacturers, and others knew, roughly, where to draw the line, involving themselves minimally, if at all, in the employment practices of their franchisees, contractors, and staffing firms. The NLRB obliterated all those lines by changing the test from control to potential control of employees. We will no longer require that a joint employer not only possess the authority to control employees’ terms and conditions of employment, but also exercise that authority. In other words, the ability to control employees or employment practices will do, whether or not it is exercised. Thus, a union can force a small contractor and its moneyed customer to the bargaining table together and tag the customer with financial responsibility for the contractor’s labor law mistakes. This decision bodes ill for small, unionized contractors seeking such relationships. In the July 6, 2015, Federal Register, DOL’s Wage and Hour Division published its plan to more than double the minimum salary requirement for an employee’s overtime exemption under 29 C.F.R. Part 541. The extended comment period for that proposal closed on September 4, 2015. We expect the rules to be finalized substantially as proposed. If so, beginning in early 2016, probably, and with specific limitations and modifications, the following changes will be put into effect. The current annual salary minimum will rise from $23,660 to $50,440, with inflation adjustments thereafter. Exemption from $50,440 to an annual salary of $122,148 will be subject to a duties test which may be tightened-up. At and above an annual salary of $122,148, exemption will be permitted if the employee performs any exempt duty. DOL marshaled loads of data to support its view that these changes will right the wrong of employer misclassification and grow the middle class, largely assuming that employers will respond by boosting to the new exemption levels the salaries of currently exempt employees. We suspect that DOL has underestimated the number of employers who will forfeit the exemptions and manage supervisor overtime as they have always managed overtime. Supervisors may not like the new workplace order. Each of these agency actions may be reversed, as soon as 2017, by a new president and his or her new appointees, with or without help from the next Congress. Live by executive action; die by executive action. Until then, employers will be challenged to adapt, improvise, and overcome. R. Pepper Crutcher, Jr., General Counsel to the Mississippi Manufacturers Association, has served employers and allied trade and professional groups for over thirty years. Crutcher’s litigation docket normally includes labor arbitrations, administrative proceedings and discrimination, retaliation, compensation, and employment contract suits. Crutcher has been rated “AV” by Martindale Hubbell® and since 2004 and has been selected to be included in Chambers USA America’s Leading Lawyers for Business: The Client’s Guide (Employment, Mississippi). He is listed in The Best Lawyers in America for Intellectual Property Law and Labor & Employment Law. Crutcher is a regular speaker and writer on the topics of employer, broker, and insurer ACA compliance.